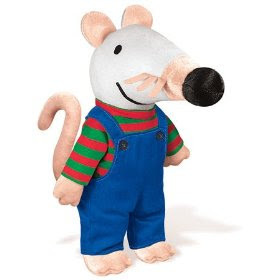 My son was a particular fan of Maisy when he was two and so we spent most of the last year purchasing Maisy books whenever and wherever we saw them. 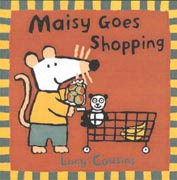 We now have a whole passel of Maisy books in our collection and we've done our fair amount of Youtubing some of the clips of Maisy Mouse. Last year for Christmas we purchased a Maisy stuffed doll (and it wasn't priced as it is now, let me be clear on that point...). Maisy has been a fun friend, as have her crew of confidants, Eddie the Elephant, Tallulah, Cyril Squirrel and Charley the Alligator. 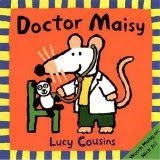 Our favorite book in our series is probably Doctor Maisy due to the fact that we're now consciously aware of what doctor's are and given the fact that in this book Maisy falls down the stairs ("because she's not being careful"). Our home does have stairs and so we reference the fact that if you aren't careful going up and down, you might fall down just like Maisy! And this is one thing we do not want to mimic Maisy in! 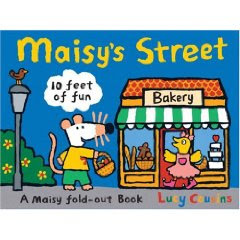 It was with some delight that we discovered that there is a new Maisy book in the series called Maisy's Street . Maisy's Street is just what it says it is - 10 feet of fold out fun that allows your 9.5" Maisy doll to meander along the road, finding her favorite shops and places of interests as well as finding her friends hidden in various places. 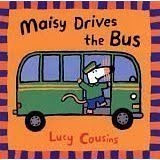 In this book, Maisy is on her way down the street to Eddie's birthday party. As she walks along you can open flaps and find other friends who are meant to join her in the fun of the party. Plus, did I mention the book folds out so that it's lots of fun for little hands and little imaginations? This is definitely one of the more creative and interactive Maisy books and, again, went perfectly with our little stuffed Maisy. 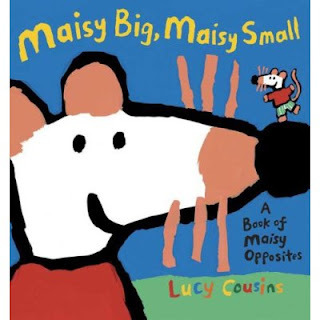 Maisy Big, Maisy Small - perfect for learning opposites. Bookworm1 can now "read" this book all by himself. If you'd like to find out more about Maisy Mouse, visit Maisy's Website (which has some interactive games). These books are cute, fun and interesting and we (still) like this mouse very much! I'm going to have to check these out for my kiddo! My girls have outgrown Maisy now and I miss her. For awhile, we lived and breathed everything Maisy. The simple text in the books engaged them so well. The simple drawings were great b/c my husband could draw the characters to entertain the girls. I'm sure I can still recite "Where's Maisy" and "Maisy's Bath" by heart. Great pick! When we used an antenna for tv last year we got Maisy! Now that we have satellite, we don't! We love her and borrow the books from the library often...but none of our own. Sadly, L. never really got into Maisy, but my older son loved a number of Maisy books and we spent many enjoyable hours reading them together. The Maisy's Street books sounds fantastic!